Ballet Classes: Our students are shown above executing a soutenu a-la-seconde movement as they warm up for the evening's Greenwood-Phinney Art Walk performances. Are there ballet classes near me, is not the only question to ask yourself when considering dance schools. Also ask, who has the best ballet classes for adults and kids in Shoreline and Seattle? All of our Ballet classes include barre, center, stretching, adagio and allegro work. We focus on clean execution and both a physical and intellectual understanding of how and why each movement is executed. With our exclusive teaching methods, you will progress further, faster and safer in half the time required by other less caring dance schools. Whether you are experimenting to see where your interests lie or might be an aspiring dancer, you will love adult ballet classes in Seattle at American Dance Institute. Still unsure? Come in and take a free trial class. We're so confident that we offer a 100% satisfaction guarantee. If you are not completely satisfied we will refund your money. But hurry, these dance classes fill quickly. Join our mailing list ﻿and﻿ get new class announcements & helpful dance tips. In addition to the adult ballet class offerings on this page, American Dance Institute of Seattle & Shoreline offers a comprehensive selection of children's ballet for ages 5-7, for ages 8-10, kid's ballet for ages 11-14, and ballet lessons for teenagers. Find an adult ballet class that fits your schedule or change your schedule to a new class. Attending class twice a week is recommended. See our Winter-Spring Schedule In Block Form. Ladies Attire: Black leotard (any style) and pink tights recommended. Alternately, students may wear black leggings with form fitting top; pink ballet slippers. Hair pulled back in a bun or ponytail. Gents: Black tights or dance pants, white T-shirt, black or white ballet slippers. Attire: Any comfortable dance attire is acceptable. Adult Ballet Shoreline & Seattle: While we recommend taking classes twice or more a week to facilitate progress, we can accommodate you in just one class if that is what works best for you. Mixing dance styles will also give you excellent cross-training (i.e. Two Ballet classes and a Contemporary class) and you'll see results much faster. However, if time or budget restraints mean taking only one class per week, then we will help you make the most of your class. Pointe Class Note: Students must take at least two ballet technique classes per week in addition to the pointe class to be eligible for pointe. 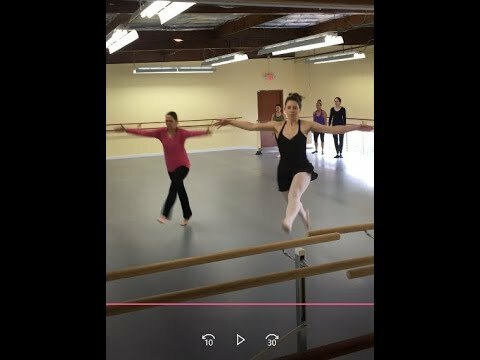 A short video filmed from the viewing of our Shoreline studio of a new beginning ballet class in their 2nd week of classes. Looking good! Intermediate ballet dancers, adults and juniors performing together for the Greenwood-Phinney ArtWalk audience in May 2018. What If I Don't Have A Ballet Body? This is a very common question and the notion that every dancer should have or maintain a ballet body is wrong. Your body is perfect. This questions speaks to the culture in dance schools. Some schools say everyone is welcome including beginner students and all body types but they may make you feel otherwise once you've enrolled. It depends on the school. At best you'll be ignored by teachers and fellow students, at worst you'll be ridiculed. American Dance Institute is truly accepting of all body types. We are a serious school, dedicated to excellence that doesn't take itself too seriously. We want everyone to experience the great joy that comes from dance. Take a free trial class and see for yourself. Feel the welcoming vibe that radiates from our staff, teachers and wonderful students. "ballet classes for adults... wonderful"
Denise S. Wrote in a Google Review: "American Dance Institute has wonderful ballet classes for adults. I danced here off and on for several years and every class I took was excellent. The staff is super friendly and professional but approachable. I started out a beginner and felt welcome from day one. I was out of shape, believe me, but still felt loved and accepted by all. I moved out of the neighborhood to a new job in a new town and I miss ADI. Come to San Francisco!" "Great ballet training without judgment or pretentiousness." "When I moved to Seattle, ADI was immediately inviting, open, and welcoming in every way. The studios, directorship, and staff offer a home for great training without judgment or pretentiousness." ADI ha﻿s friendly, accommodating and non-competitive ballet classes. What does non-competitive ballet classes mean in this context? It means that everyone competes with themselves, not with other students and not with you. Ballet Studios: Som﻿﻿e competitive ballet studios are filled with tension. Remove competitive behavior and a supportive and encouraging environment will flourish. That is why you will always feel welcome in our ballet classes, and feel you belong in the class no matter your proficiency, body type or age. It is a fun and wonderful environment to learn in. We understand that many people experience some apprehension when committing to a new dance class, especially ballet. Our f﻿﻿a﻿﻿bulous Ballet ﻿instructors break everything down so that you learn it quickly. This ballet school is just what you need. Please try our Seattle & Shoreline Ballet classes and experience the joyful ADI difference. Students engaged in barre exercises during Adult Ballet dance Classes at American Dance Institute. What does an excellent ballet school look like? ADI's Seattle and Shoreline ballet classes for adults cater to new-beginning, intermediate and advanced ballet students. Come learn, dance and experience the joy that only dancers know. It has non-competitive ballet classes where everyone competes with themselves and not fellow students. No competition makes for friendly teachers and classmates so you will always feel welcome and accepted. It's a ballet class where the teacher understands that the pace of the class has to be good for you and knows how to balance that pace for everyone. Dance studios have 'sprung' wood floors that 'give' to protect knees, feet, and ankles. Run away from studios with padding & hardwood over concrete. The standard padding inserted between concrete and hardwood does not 'give' enough to protect dancer's feet. And heaven forbid, run, run away from dance studios with just concrete or linoleum on floors. Ignoring this advice can result in serious early injury to knees, ankles, and feet. A school with accommodating school policies, like a 100% money back guarantee if you don't like your class for any reason, your health or schedule changes unexpectedly. Expert dance teachers who know how to give you personalized attention so you can learn faster and progress further. What do adult Ballet students say about these Ballet classes?